Matthias Grabmair, ISP Ph.D. student, received the Best Student Paper Award during The Thirteenth International Conference on Artificial Intelligence and Law (ICAIL 2011). The award winning paper "Facilitating Case Comparison Using Value Judgments and Intermediate Legal Concepts" illustrates how legal case-based reasoning can be modeled in a formalism based on arguments about the interaction between fact patterns and underlying legal values. It is co-authored by the ISP faculty member Kevin D. Ashley. ISP Grad students Saeed Amizadeh's and Shuguang Wang's paper, "An Efficient Framework for Constructing Generalized Locally-Induced Text Metrics", was accepted to the Twenty-Second International Joint Conference on Artificial Intelligence (IJCAI 2011). The IJCAI is the most prestigious AI conference and will take place in Barcelona, Spain July 16th through July 22nd. The conference is very selective in accepting papers, in 2009 only 331 were accepted from almost 1300 submitted to the conference. The paper was also authored by ISP faculty, Milos Hauskrecht. Diane Litman, Director of ISP, and Kevin Ashley, ISP faculty, participate in the IBM Watson Symposium on March 30, 2011. This day-long symposium included a series of discussions with Pitt and CMU experts in technology, health care, and law. Diane Litman was a panelist in the Natural Language Processing (NLP) forum, along with David Ferrucci, PI of the deepQA/Watson Project for IBM; and Eric Nyberg, professor in CMU's Language Technology Institute. Kevin Ashley was one of three presenters about the real world applications NLP technologies, with Donald Burke, dean of Pitt's Graduate School fo Public Health and Brian Butler, professor of business administration. The symposium ended with the IBM Watson Presentation, Demonstration and Q&A Panel with a Jeopardy! challenge between Pitt student team, CMU student team and Watson. Read the March 28, 2011 Pitt Chronicle article. Read the March 31, 2011 Post Gazette article. Read the April 4, 2011 Converge Magazine article. IBM Communications interview with Diane Litman. University of Pittsburgh Mediasite NLP & Watson panel discussion. ISP alumni, Vincent Aleven ('97) and Cristina Conati ('99), are the two new Associate Editors of the International Journal of Artificial Intelligence in Education (IJAIED). They join current IJAIED Associate Editor, Judy Kay and Editor-in-Chief, James Lester. IJAIED is the premier journal in artificial intelligence in education. The Journal publishes papers concerned with the application of artificial intelligence techniques and concepts to the design of systems that support learning. Vincent Aleven is an Associate Professor in the Human-Computer Interaction Institute at Carnegie Mellon University (CMU). Cristina Conati is an Associate Professor of Computer Science at the University of British Columbia. 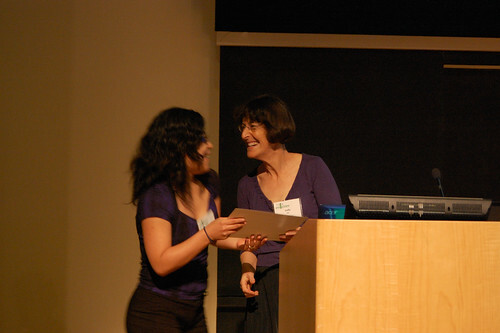 Min Chi's, 2009 ISP graduate, receives the Best Paper Award during ITS 2010. "Do Micro-Level Tutorial Decisions Matter: Applying Reinforcement Learning to Induce Pedagogical Tutorial Tactics" was co-authored with Computer Science faculty member, Diane Litman and Arizona State University faculty member, Kurt Vanlehn. The award winning paper is based on Min's dissertation work, with Diane Litman her major advisor and dissertation committee chair. Events for the 10th International Conference on Intelligent Tutoring Systems: Bridges to Learning (ITS 2010) was held in June at various locations on the Carnegie Mellon University campus. ISP sponsored the workshops for ITS2010. 2006 ISP graduate Changhe Yuan was awarded the 2010 NSF career award for his work titled "Explanation, Decision Making, and Learning in Graphical Models" at Mississippi State University. Congratulations! ISP Graduate Student Collin Lynch, ISP Faculty Kevin Ashley, and ISP Alumnus Vincent Aleven are co-organizing a workshop in Intelligent Tutoring Technologies for Ill-Defined Domains with faculty from Germany, UK, and New Zealand. The workship will be held at the 10th International Conference on ITS 2010 to be held June 14-18 in Pittsburgh. Submissions are open and due by April 15th. Please see the Call for Papers. Ilya Goldin, ISP student, conducts a workshop at ITS 2010. ISP Graduate student Ilya Goldin, ISP faculty Peter Brusilovsky, Chris Schunn, and Kevin Ashley, with I-Han Hsiao are conducting a workshop at the 10th Annual ITS 2010: Computer-Supported Peer Review in Education. ITS 2010 will be June 14 - 18, 2010 at Carnegie Mellon University. The workshops are on June 14th and June 18th. Submissions are welcome and due by April 15th. Please see the Call for Papers. An all-day event, The Grad Expo 2010 , is Monday, March 22, when A&S graduate students present papers and posters to their fellow students, faculty, and other members of the Pitt community. The Expo is held at the William Pitt Union and events are scheduled all day from 8:45 a.m. through 5:15 p.m.
Cem Akkaya and Shuguang Wang have been awarded the Mellon Fellowship for the academic year 2010-2011! Congratulations to Cem and Shuguang!